KCTV 5 reports a rodeo clown’s controversial Missouri State Fair antics went viral after President Barack Obama was spoofed and mocked. t divided people across the country on whether Tuffy Gessling’s stunt was disrespectful to Obama. Another clown wore an Obama mask while Gessling made questionable comments, including saying, “We’re gonna stomp Obama” and other comments that some took to mean suggesting physical threats. But the clown says it was all in good fun as has been done with other presidents. 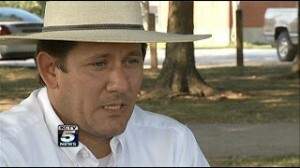 Gessling became the center of a firestorm, and he contacted KCTV5 exclusively to provide his side of the story. The incident occurred Aug. 10 at the fairgrounds in Sedalia during the The Missouri Rodeo Cowboy Association finals. Gessling’s antics drew angry rebukes from politicians, a lifetime ban from the Missouri State Fair and more personal hits than he ever faced in the ring. “I’ve had one lady spit in my face – called me a dirty name, spit in my face and walked off,” Gessling said. And he says there have been five death threats. “I’ve had somebody threaten to run me over. One of them wanted to burn the house down,” he said. I think we do the president a disservice if we are not allowed to make fun of him like past presidents. Either President Obama is a grown man who can take it, or he’s something else. Which is it?